I recently attended a 12 hour crop at a local scrapbook store with a friend of mine and it was actually one of the first times in almost 2 years that I’ve scrapbooked a 12×12 layout without my camera recording. It was an odd feeling. I almost felt guilty for scrapbooking & not recording it for my YouTube Channel…how weird is that?! Videos have become such a large part of my process that I was actually contemplating whether or not I should use these layouts as Design Team projects because I didn’t have a video to correspond. But I ran out of time to make anything else & decided to share them! HA! This first layout from the crop that I’m going to share uses the palm leaves from the Summer Vibes Cut File. One of my favorite summer collections right now is the Pebbles Patio Party Collection so it seemed fitting to use it with this layout. There are a lot of brown tones in that collection and it paired perfectly with my 2 photos I used on the layout. I sometimes feel restricted or unmotivated when I attend crops because I don’t have all of my supplies on hand (even though I ALWAYS overpack!) & the creative environment is just so different than when I’m sitting in my normal craft space. When that happens I like to let the products speak to me. I loved the diagonal design of the Scattered Posies Patterned Paper and decided to use that as the basis of my layout. I splashed a little yellow on the background, and then using my Cricut, I cut 2 palm leaves from the Summer Dreams Patterned Paper. I tucked the palm leaves under my photos and then used Die Cuts and the 3D Flowers from the Patio Party Collection to embellish. These photos crack me up…well more the bottom photo than the top photo. I remember this age so vividly. It was like pulling teeth to get this kid to look at the camera and smile at the same time. I had to take every photo at least two or three (okay, maybe five) times to get a “good” one. It felt so frustrating in the moment, but looking back at it now…those “bad” photos are my favorite. It captures so much of his personality at that age…what 3 or 4 year old has time to pause and look at the camera?! HA! I came across these photos in a box in my craft room & just laughed out loud. Who would have ever thought these photos would now be some of my favorites?! I knew my title needed to be something to that effect. I know we were at the zoo when I took these photos, but the story I wanted to tell didn’t have anything to do with the zoo. It had to do with what I was feeling the moment I found these photos years later. I used the Alphabet Thickers from the Crate Paper Wild Heart Collection to spell out the only title that seemed fitting! I also printed a few lines of journaling using my computer & printer and adhered them to the page in the same diagonal fashion. I actually really like that the journaling almost looks hidden within the text print of the background paper! For final touches I stamped a few sentiments from the Stamp Set from the Crate Paper Good Vibes Collection & added a few Black Color Shine splatters. I love that The Cut Shoppe always seems to have a cut file perfect for all of my layouts and how I turn to them over & over again! 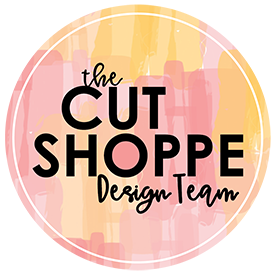 Remember to visit the Etsy Store to check out all of the cut files and to post your layouts in The Cut Shoppe Scrap Spot Facebook Group so you can see what you’re creating! This blog post contains affiliate link. This means I will receive a commission (at no cost to you) from items purchased from those links.